This past month, General Electric (GE) was dropped from the Dow Jones Industrial Average after more than 110 years in the Index. GE was the last founding member of the index in its current format. This watershed moment calls our attention to the fragility of business success, constantly under attack by competitors, technological innovation and regulation. Somar is relentlessly searching for short opportunities created by the abundant innovation we see in the world right now. We look for incumbents with high market shares and inferior consumer offers. The current strong and accelerating pace of innovation creates a fertile environment to find such opportunities. We are excited and believe that the Somar investment method positions us well to take advantage of them. We have seen a larger number of former leaders go through hard financial times in the past few years. 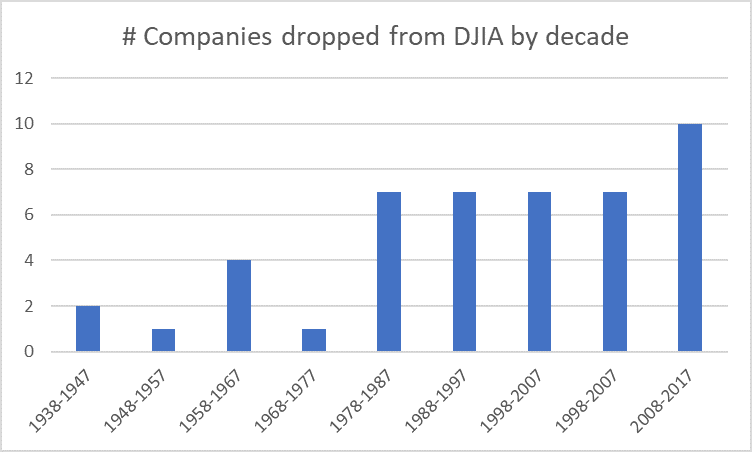 The accelerating disruption of large incumbents can be seen for example by analyzing the number of companies dropped from the Dow Jones Industrial Average index (composed of 30 companies). As Fig. 1 illustrates there has been a growing trend over the past few decades. economies, superior customer information / customization, embedded in business processes). components were more diversified (see Fig. 2). However, a lot of these companies no longer exist, others have gone through bankruptcy proceedings (e.g. not guarantees of future financial success in the face of innovative competitors. through both media campaigns and capilar store fronts to offer affordable fashion to the masses. a competitive weapon to keep expanding and taking market share against smaller mom and pop chains. advantage in the fashion industry has opened several short opportunities for Somar. finding them and making them work for you. We will continue to report to you on our progress. 1 Chicago & North Western Railway Company; Delaware, Lackawanna & Western Railroad Company; Lake Shore Railway Company; Louisville & Nashville Railroad Company; Missouri Pacific Railroad Company; New York Central Railroad Company; Northern Pacific Railroad Company; Pacific Mail Steamship Company; Chicago, Milwaukee & St. Paul Rail Road Company; Union Pacific Railroad Company; The Western Union Telegraph Company. 2 Amalgamated Copper Mining Company; American Car and Foundry Company; American Smelting & Refining Company; The American Sugar Refining Company; Colorado Fuel and Iron Company; National Lead Company; The Peoples Gas Light and Coke Company; Tenessee Coal, Iron and Railroad Company; United States Rubber Company; United States Steel Corporation.